What happens when you combine a Slide'n Splash Water Slide & Pool with 10 of the most powerful water guns available? Water Wars! 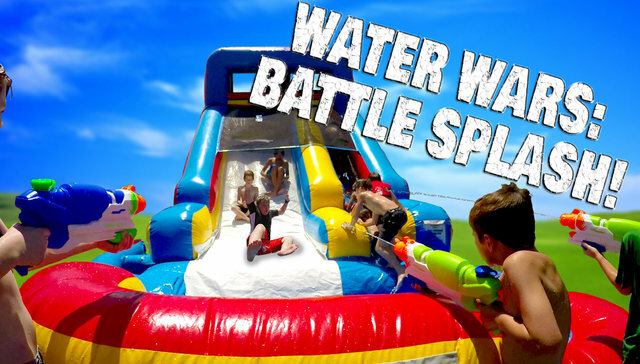 Along with your Slide'n Splash Water Slide, you'll get 10 Nerf Super Soaker Barrage™ water guns (2 teams of 5) and the war is on! We also provide a hose splitter so that the water guns can be refilled without stopping the action on the slide! SHOOT THE SLIDERS: Shoot the sliders from the ground. Choose strategic angles to maximize slider soakage, or gang up for a mega soaking assault! WATER WARS: Blue team vs. Green team; play inside and outside of the Super Combo, there's plenty of places to hide out and surprise your opponent! SKY FALL: Coordinate all 10 players to shoot directly up into the sky on the count of 3; it's time to MAKE IT RAIN! Create a RAIN STORM by constantly shooting straight up until out of water - then refill! 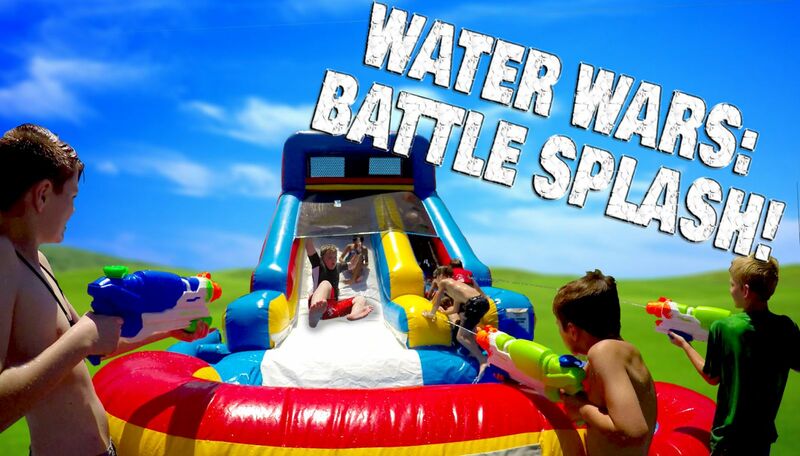 GENERATION WARS: Time for the adults to get in on the action; grab your soakers and blast the kiddos as they come down the sllide! For more water gun related games, Google "water gun games". 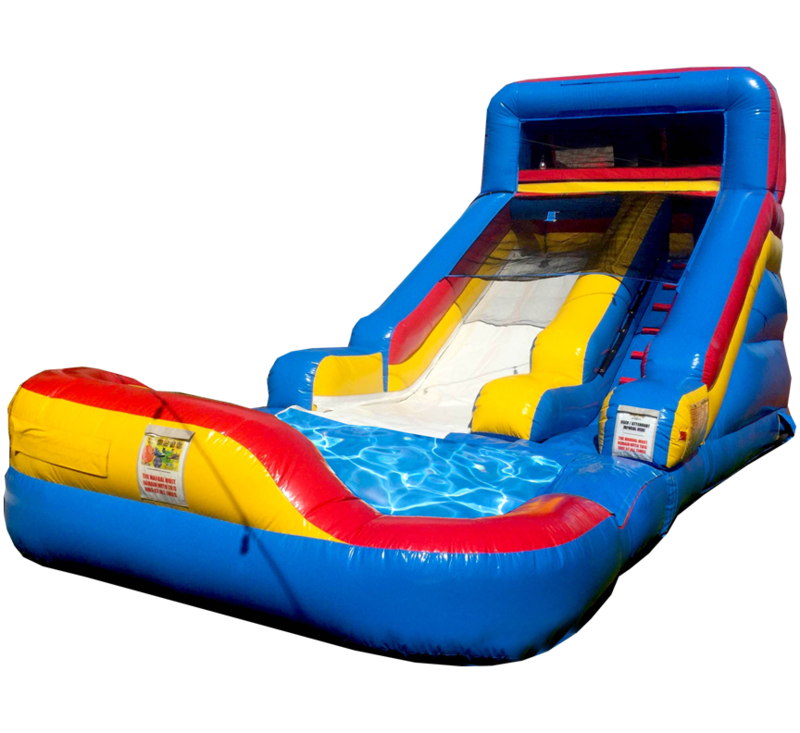 The Slide'n Splash features a wide sliding lane and large pool. Any group of kids are sure of being entertained and captivated for hours by the Slide'n Splash Water Slide. The bright primary color scheme brings an element of fun to your event location. This unit features all of the most recent safety updates. CAPACITY: 20-50 participants per hour. An adult MUST be present at ALL TIMES while unit is in use. NOTE: Guns must be emptied and dry prior to your driver returning for pickup of equipment.